There’s a light, warm breeze blowing over my face, I’m lying back watching a magnificent sunset with a handsome man at my side, a Martini in hand and romance in the air. Am I in gay heaven? Not quite, but at 63 stories above Bangkok I may be close. Bangkok has an ever-expanding selection of amazing rooftop bars and restaurants. I’d strongly recommend taking the time to visit at least one during your trip to Bangkok – the views are simply breathtaking. Chances are at least one of these will be close to you, so find that someone you wish to wow and get high in Bangkok. How high do you want to get? At 84 stories, the Baiyoke Sky Tower almost puts you in the stratosphere. It’s a little old and tired – I’d recommend trading altitude for style and heading to one of the other options listed below. 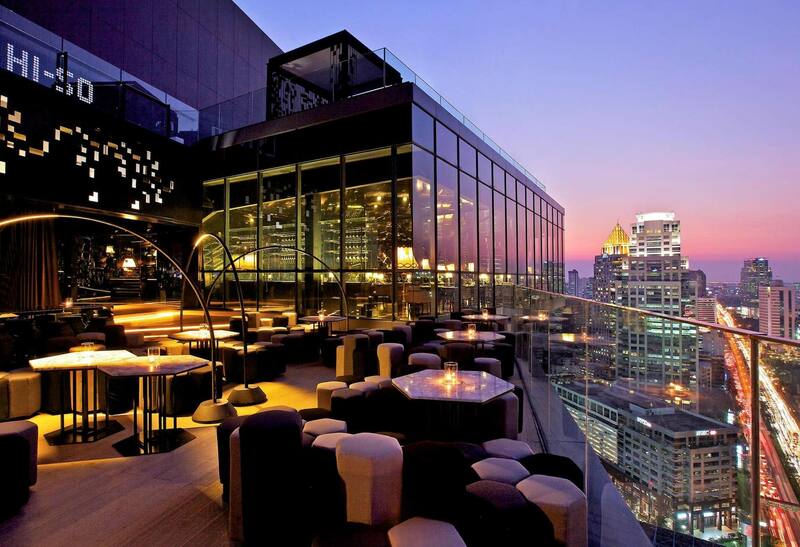 Moon Bar at the Banyan Tree on the 63rd floor was one of the first rooftop bars to open in Bangkok. Elegant and intimate (and one of the highest), it remains a favorite of mine. The new Sofitel So Hotel serves up So Society on the 29th floor, offering a nice view of Lumpini Park. The most popular rooftop bar in Bangkok is the Sky Bar and Sirocco restaurant at State Tower, located at the river end of Silom Road. There’s a reason it is crowded almost every night of the year – the majestic panoramic 63rd floor view takes your breath away. Most nights there is a live jazz band which adds an elegant atmosphere. Another good option on Silom Road if you want to avoid the crowds of State Tower is Scarlett on the 37th floor of the Pullman G Hotel. My favorite riverside rooftop bar is the 360 degree bar at the Millennium Hilton (and the adjacent outdoor deck bar). Providing great river views all the way to the Grand Palace and Wat Arun, it is elegant, stylish and less crowded than Sky Bar. If you’re staying in the central Siam area, check out the Red Sky bar at the Centara Grand hotel in the Centralworld complex. On the 55th floor, its also one of the highest bars in Bangkok. Long Table , located on Sukhumvit 16, won’t get you as high at only 25 stories, however it remains a favorite with resident expats and locals. With a unique concept and design, the pleasant view over the surrounding lake and park more than make up for the lower altitude. Enjoy getting high over Bangkok – I’m sure you will love it. Remember – all of the bars and restaurants mentioned have a dress code so no flip-flops or sleeveless shirts.